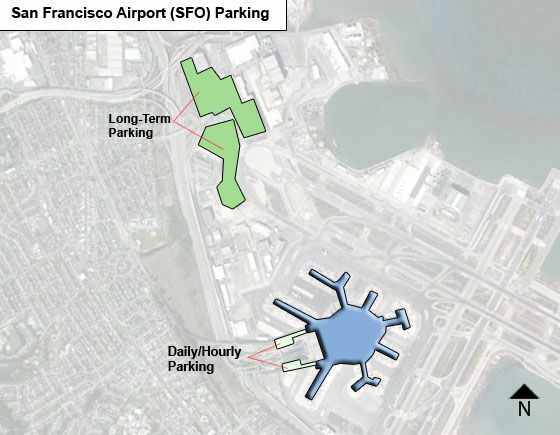 SFO has a close parking option for every need and budget. Choose from the Domestic Parking Garage with a 5-minute walk to the terminals, the International Garages A and G with a 10-minute walk to the terminals, or the new Long-Term Garage Parking with a quick shuttle ride to the terminals. All SFO parking facilities make entry and exit easy and offer quick payment methods. Free Cell Phone Waiting Lot Wait for your arriving party until they have collected their luggage and call you to be picked up curbside. The lot is just five minutes from the terminals. 60 minutes is max. waiting time and the lot closed between 1am & 5am. Do not leave your car unattended. First come, first serve. There is a flight arrival information kiosk, as well as water/soft drink vending machines. Daily max (24 hrs) - $33. Daily max (24 hrs) - $20. Daily max (24 hrs) - $14. daily max (24 hrs) - $35 for non-members. Each add'l 24-hr period - $45. Three Payment Options: All major credit cards accepted. 1. Credit Card In and Out - Insert credit card upon entry and park. Upon exit, insert credit card again (with same credit card as entry). Collect printed receipt and credit card; exit. 2. Ticket and Credit Card - Take ticket upon entry and park. Upon exit, Insert ticket, then credit card. Collect printed receipt and credit card; exit. 3. Ticket and Cash Payment - Take ticket upon entry and park. Drive to a Cash exit booth. Insert ticket into machine. Pay cashier, collect printed receipt; exit.